This chutney bears little resemblance to the chutneys one buys in jars. It is fresher, brighter, and less acidic. It is both authentic and absolutely delicious. It makes a nice accompaniment to Indian food, but it is also great with a simple roasted chicken, or even to spark up some cottage cheese. Enjoy. Heat the oil in a small saucepan over medium-high heat. When oil is hot, add cumin seeds and fry, stirring constantly, until lightly colored, about 30 seconds. Add the ginger and garlic and fry, stirring, for another 30 seconds. Add the mango, pepper flakes, cinnamon, cloves, lime juice, sugar, and salt. Mix thoroughly and reduce heat to low. Cook, stirring occasionally, until the mango softens and the liquid begins to thicken, about 15-20 minutes. Can be served warm or cold. Can be kept in the refrigerator, in a closed container, for up to 6 days. Makes about 2 cups. When I arrived in Chennai in southern India, almost the first thing my guide pointed out was the mango trees. He told us that there are 400 varieties of mango in India, which is about half of the varieties that exist worldwide. 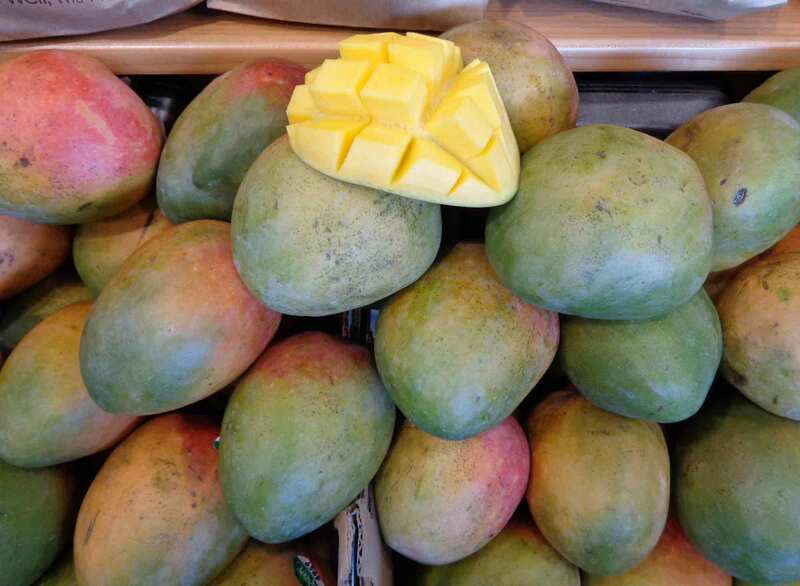 It may seem to us in a temperate climate that a fruit tree is not the first thing you’d point out to a foreign visitor, but the mango is not just another fruit tree; mangoes are the most important fruits in the world, and in fact are one of the planet’s 15 most important food crops. And nowhere is this more evident than in India. I was tipped off to this fun fact by Jen, a woman who publishes a fly fishing magazine for women. She related that the earliest known book on fishing was in fact written by a woman–and was published in 1496. Of course, the news that a woman was writing about fly fishing 500 years ago piqued my curiosity. I had to dig deeper. Titled A Treatyse of Fysshynge wyth an Angle, the book was written by Dame Juliana Berners. An angle is a hook, and its originally being called an angle is why we call fishing with a hook and line (vs. nets or traps) angling. Dame Juliana was an English noblewoman and prioress who loved, and was good at, fishing, hunting, and heraldry. A bit more research turned up the fact that Treatyse is still admired, as it was a remarkable work for its detail and vision. It offered a comprehensive guide for the anglers of its time, with information on fishing destinations, rod and line construction, and selection of natural baits and preferred artificial fly dressings categorized by the season during which they’d offer best results. However, as valuable as that information is, the thing that makes the book most remarkable is its foresight. There are essays on the virtues of conservation, respecting the rights of streamside landowners, and angler’s etiquette, with ideas that have really gained traction in recent decades. Also remarkable is that you can get it on Amazon! As for Jen’s magazine, it’s a handsome and useful work for today’s anglers. You can check it out here: Dun Magazine: A New Rise in Fly Fishing.